- My name is Eshraq Abdullah Hammad. - I am from Yemen. 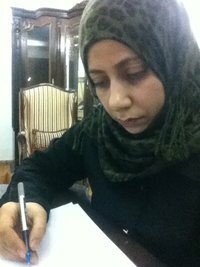 - Working at the Permanent Mission of the Republic of Yemen to the Arab League in Cairo from 2010 - 2014. - I joined the MOFA in 2004 after successfully passing the selection procedure to become a diplomat. - At the beginning I worked at the Department of Media for two years, after which I was moved to the minister cabinet. - After that I have been posted to the Permanent Yemeni Mission to the Arab League in Cairo from 2010-2014. - In answer to this I must say that I was enthusiastic to be a diplomat. However, I faced big challenges as a Yemeni lady, coming not only from a conservative familybut from a conservative society as well. - I started my duties as a diplomat and tried to get some experience. In order to achieve the goals I have, I plan to continue this path and get a master degree and become an ambassador in the future. - Here I think the biggest challenge I face during daily life is when I have to deal with those who do not believe in a woman as a qualified person. - Well, I do remember something special. When I was told that I had been chosen from seven candidates who were higher ranking than me, to participate in a seminar in Germany, it came as a big surprise to me. - I really do like my job and will never give up inspite of the big challenges in my society. - I like your ideas and support building the alumni network. I hope it will be successful in actively connectingdiplomats around the world to share experience and culture, exchange information and so on.I believe it will be great to have an exchange of dialogue of different societies. From my point of view this is very important. It's my pleasure to participate in your network, I don’t have a special suggestion, so just let me know how I can contribute. Basically I'll focus on Yemen. These interviews are the opinion of the interviewed Alumni and do not represent the views of Training for International Diplomats or the Federal Foreign Office. Training for International Diplomats and the Federal Foreign Office are not responsible for the content of these interviews.